Thank you all for making this a special season. We had a great time catching up with families that have kept us a part of their Christmas tradition as well as meeting new friends! This year, we’ll be open on Friday, Saturday, and Sunday starting November 24th. We will stay open until the trees are sold out. We look forward to seeing you this season! We are now closed for the season. We are not opening for today, Dec 4. We had a blockbuster day yesterday. In order to remain sustainable we have to close a day early. Thank you all for making us a part of your Christmas Celebration. We know that some of you will be forced to change plans and we apologize for that. We hope we can be a part of your holiday next year. Merry Christmas! Come out to the closing weekend! Sunday Dec 4th will be our last day of the season this year. We are thankful for all of you making us a part of your Christmas celebration. We’re getting the farm ready for Christmas 2016! This year, we are going to open our 2016 season on November 25th. We’ll be open from Friday through Sunday from 9am until 4pm through December 11. The growing season has been great and the trees look fantastic. We have so much gratitude and joy for all of you that shared your Christmas with us. Thank you for coming to the farm and being a part of our Christmas. We’re now closed for the 2015 season. We’re already looking forward to seeing you all next year. Merry Christmas and God bless. We’re closing for the 2015 season on Friday December 11. What a season! We’ve loved sharing our farm with all of you. To make sure that we’re a sustainable farm and can have you all again for Christmas next year, we are going to close early. Need a tall tree? We’ve got them! Same price as our regular trees. So if you’ve got a spot that begs for a tall tree with lots of lights, come see us! It was a lovely and sunny day on the farm today. A chill in the air made it a perfect day to cut a tree. We’ve got a few photos to share! Searching for the Perfect Ornament? We’re Open for the 2014 Season! Always wonderful to start the season! We had a rainy but wonderful opening day – Some serious cuteness around the farm! It’s a sunny and beautiful day at the farm! Morning All! Today is our first day of the season! We’re excited to see so many of you this year and hope you’ll all come out and make the Bowen Tree Farm part of your Christmas tradition! We’re really excited to open this 2014 season on November 28th. We’ll be open from Friday through Sunday from 9am until 4pm through December 14. We’re excited about the Christmas Cottage again this year, and we’ve collected some very unique gifts. We’ll post some photos this week! Come see our Nordmann Fir, Noble Fir, and Grand Fir trees! It’s been a wonderful summer for us here at the farm and we’re excited to have you all here as our guests again. We’re excited to see familiar faces and new friends alike. The Grand Fir is a native of the Pacific Northwest and we love growing them. Our tree farm has great soil for growing these beautiful trees. We hand prune all of our trees and the Grands are a joy to work with. We love the smell of these trees – it’s a very traditional Christmas tree smell with a bit of citrus. The needles are a glossy dark green and soft to the touch. It’s a very pretty tree with a very traditional shape. We opened for the season on Friday, November 29, 2012. We’ll be open Friday through Sunday for the Christmas season from 9am until 4pm. Come visit the Christmas Cottage and bring your family and cut your own Christmas Tree this year. We’re excited about our Grand Firs this year! We have beautiful Grand Firs this year. We grow three kinds of trees, and so every year we have a slightly different ratio of trees coming into their full size. This year, we have an abundance of Grand Firs that our summer weather made shiny and strong. We’ve spent all year caring for our trees, and a new crop is ready for Christmas. We’ll be opening this season on November 29th. Are you looking for a traditional, fragrant, and beautiful Christmas Tree? You should come see our Grand Fir Trees at the Bowen Tree Farm. These are beautiful trees with full, natural shapes that makes them perfect for a traditional Christmas tree. We like how the bright, green needles look with white twinkling lights. We’ve been blessed with wonderful customers over the years. We at the farm cherish being a part of so many families Christmas Traditions. We took some photos this weekend around our outdoor fireplace, and with their permission, we’re sharing these photos with all of you. The Christmas Cottage is glittering with gifts and ornaments! Looking for a Nordmann Fir tree? The Nordmann Fir was featured on the cover of Good Housekeeping Magazine in December 2009, and we think that these are the perfect Christmas Tree. This tree has been a good disease resistant species that doesn’t need extra pesticides. We think that they have a particularly striking shape and wonderful color. Bowen Tree Farm is a family farm in Arlington, Washington that sells beautiful Christmas trees. We have an outdoor fireplace, free hot cider, and acres of trees to wander through. 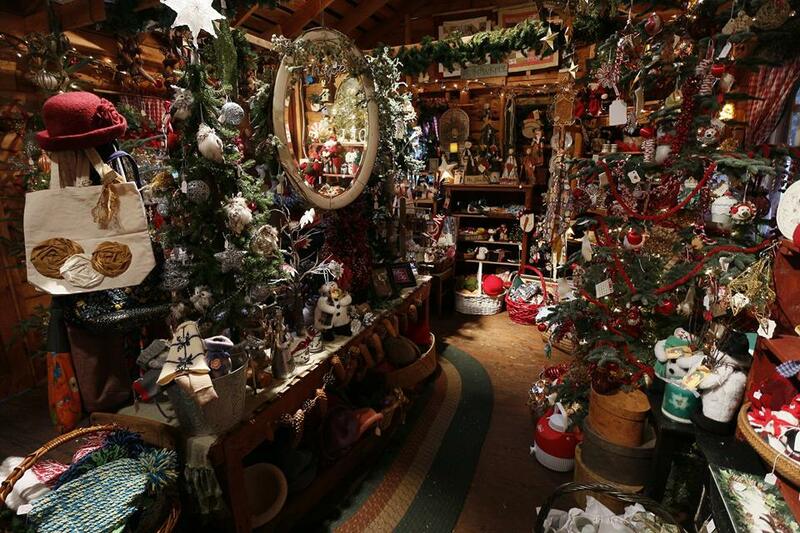 We have a Christmas Cottage that is full of unique items to help you decorate for Christmas and where you might find the perfect gift for a hard to shop for friend or loved one. Christmas 1992 we opened this farm as a family run business. Throughout the years we have stayed committed to growing naturally and hand pruning each tree. Currently we grow four varieties of trees: Nordmann Fir, Noble Fir, Grand Fir, and Fraser Fir. Each tree variety offers the characteristics we feel are essential for the perfect Christmas Tree.